US, 1942, 92 minutes, Black and white. Lewis Stone, Mickey Rooney, Cecilia Parker, Fay Holden, Ann Rutherford, Sara Haden, Esther Williams, William Lundigan, Bobby Blake, Susan Peters. Directed by George B. Seitz. 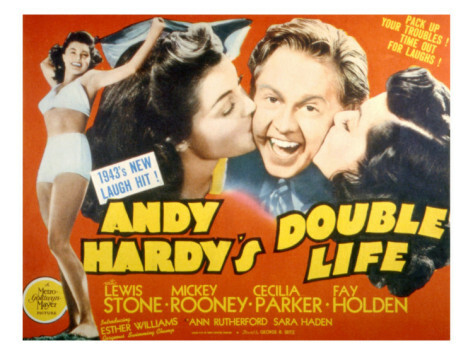 Andy Hardy’s Double Life is the eleventh Andy Hardy film in the series which began in 1938. There were two more films after this – and a later film during the 1950s. By this time Andy Hardy has grown up, is about to go to college. He has an old car, wants to sell it to his friends, his buying a new car from New York. As he goes to college, his father wants to accompany him and introduce him to all the important people on campus. This becomes a major crisis as Andy Hardy wants to stand on his own two feet, not have any reputation because he was the son of a judge and knew the important people at the university. This leads to a strong final confrontation between father and son, with Andy Hardy explaining the situation to his father who comes to understand it. The film is very much of its period – but, in terms of giving an image of an American family (which prompted Louis B. Mayer to promote the series at MGM), it is an interesting portrait of young and older people at the time (and a lot of slang included). Lewis Stone brings his usual gravity to the role of Judge Hardy – although he has some sequences on a billycart in which he has to solve a case, and the billycart helping when there is a puncture on the car which is to take him to the station to see his son off to college. Fay Holden is both sentimental and worldly-wise as Mrs Hardy. Cecilia Parker is Marian, now grown up, and in love with a seeming ne’er-do-well of the town, played by William Lundigan. Ann Rutherford has a recurring role as Polly Benedict, only a short episode here – although she introduces her friend who is played by Esther Williams. Esther Williams was introduced in the film – and has a swimming sequence with Mickey Rooney, right at the start of her on-screen career. Susan Peters has a pleasant role as the young co-ed on the train at the end of the film, surprising Andy Hardy who thought the college was only for men. The film, along with the others in the series, is a tribute to fundamental small-town American values and a portrait of family.